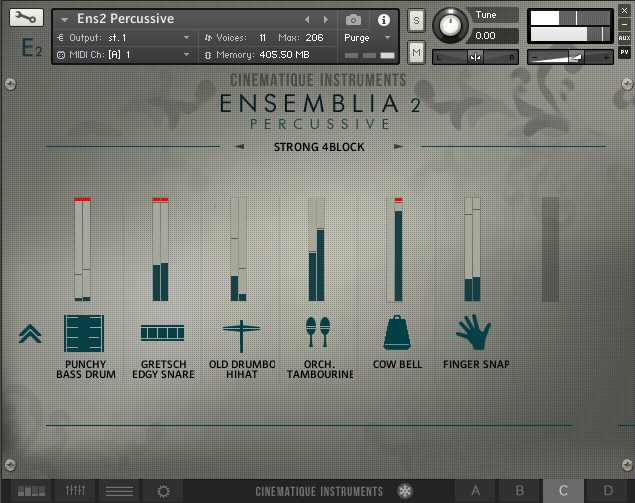 Cinematique Instruments has developed a reputation for rare and unique instrument libraries particularly suited for film composers and sound designers. 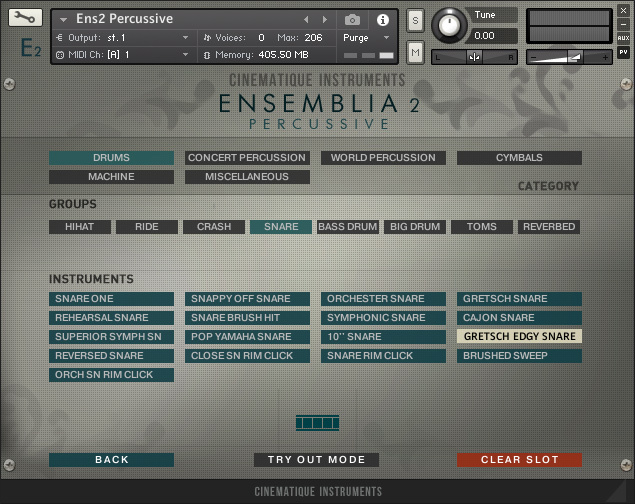 The German-based developers refer to their recent Kontakt instrument release Ensemblia 2 Percussive, as an evolutionary revamping of the original version, rebuilt from scratch with a completely new GUI. The sounds are exquisitely recorded and contain 1.22 GB of content including: 25 snares, 24 big drums, 27 toms and ethno drums, 29 cymbals, 15 shakers, gongs and singing bowls. 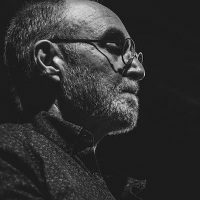 Much of the material was performed by Michael Askill, an Australian percussionist “known and admired for his enduring contribution to the Australian contemporary music landscape and his original blending of Asian and Western sounds”. Over 200 instrument sounds were recorded in 4-8 round robins and 3-10 velocity layers. The Mixer displays up to seven tracks and allows for control of level, tuning, length, EQ, compression, reverb and delay. 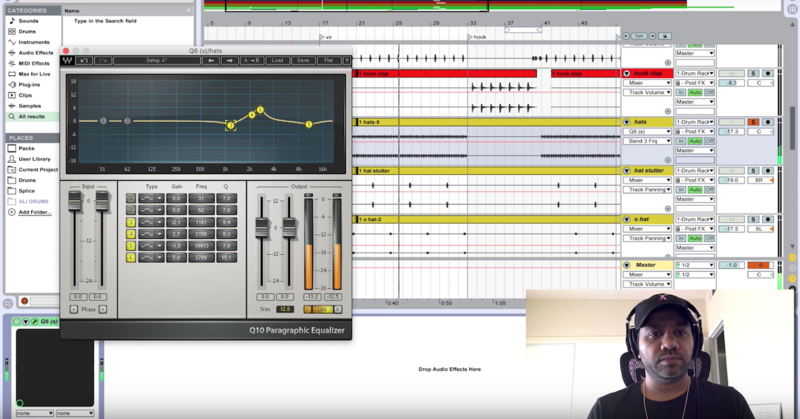 In additional to traditional panning, you can activate 3D panning, which seems to be a sort of binaural panning effect similar to that found in Logic Pro. The View displays instruments names, levels and current preset. The Instruments view displays a navigation menu organized by categories, groups and instruments. 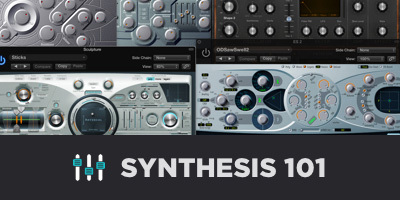 The Presets window offers a three column navigation matrix with nine main categories: World, Score, Folk, Garage, Jazz, Pop, Urban, Floor Four, Experimental, Essential and Kits. The Arranger view is a step sequencer with a row for each of the seven possible instruments. It displays up to eight beats and subdivisions can range from 8th note triplets to 32nd notes. Clicking on a track icon exposes a Submenu where you can perform various step editing functions including a handy Humanize effect that randomizes velocities and a Generate function, which seems to scroll through a series of 10 presets that get increasingly complex and dense. The asterisk next to the company name activates Freeze mode, which allows the instrument to run indefinitely when a key is pressed based on the subdivisions in the Arrange mode. 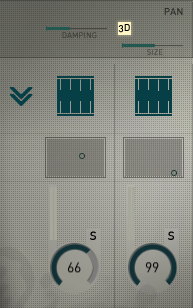 The A-D slots allow for four independent Ensemblia settings which can be accessed via key switches. The Pattern Run key switches determine the speed of the sequencer which could be double-time, regular, half-time or with random tempo changes. The Repetition key switches will cause certain steps to repeat. The Live FX key switches will activate various effects such as convolution reverbs, saturation, a low-pass filter or a bit crusher. 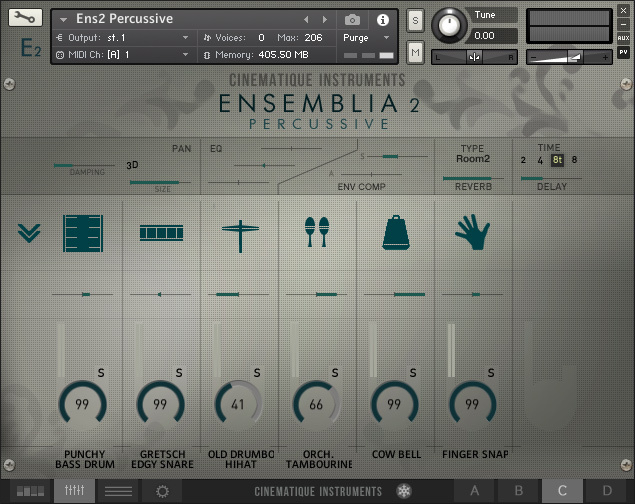 In addition to the main Ensemblia 2 instrument, several Percussive instrument collections are included, ideal for constructing your own Multis. 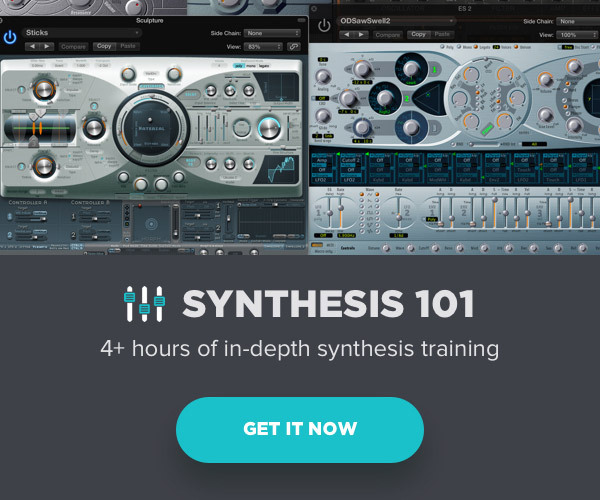 Categories include: Bass Drums, Big Drums, Cymbals, Glitch FX, Gongs and Bells, Hit Hat and Shaker, Snares, Toms and Ethno, Wood and Metal, and Miscellaneous category of claps, finger snaps and various objects. The sounds in this instrument are pristine, high quality recordings performed flawlessly. 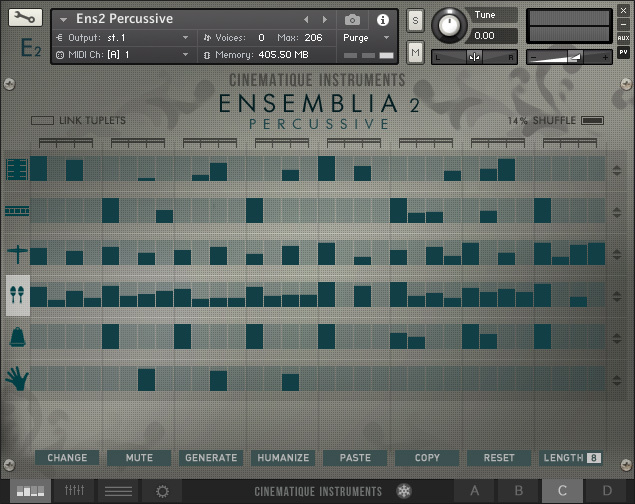 Although there are electronic and glitchy sounds included, I would say the strong suit of Ensemblia 2 Percussive lies in acoustic sounds and specifically orchestral instrument samples. Aside from some random redraw issues with the GUI, less than obvious control locations (such as the 3D button) and one crash (which was undoubtedly due to my overzealous experimentations), I have nothing but praise for the sounds this instrument can produce. At the current price of 165 Euros (about $200), it would surely be a worthwhile addition to your existing percussion arsenal. 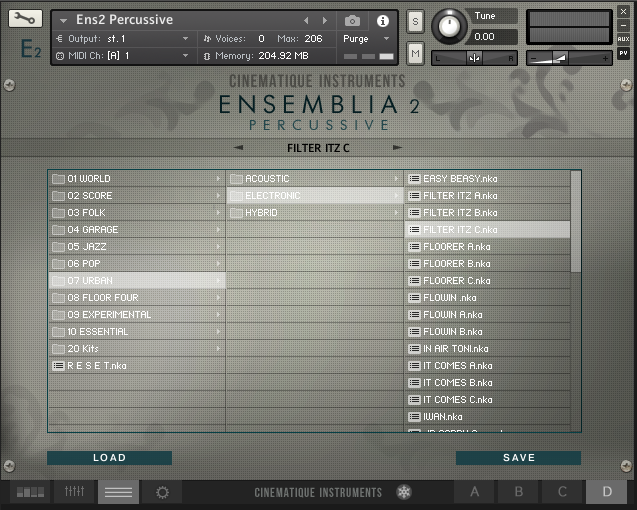 I also highly recommend exploring the entire sonic portfolio of Cinematique Instruments, which includes a host of string instruments, deconstructed pianos, and delicious metallic and glassy sounds.